The Irazu volcano is located inside of the national park that goes by the same name, its located about 32 km north of Cartago, Costa Rica, this is very easy to access, has 3,432 meters of altitude, its irregular conic shape has 3,432 meters of altitude, it has five craters, but you can find 3 main structures; an active crater towards the northeast with about 1000mts of diameter, a depth of 180mts that houses a beautiful lake. It also has the crater Diego de la Haya Fernandez, which is inactive, this is to the north of the caldera with about 80mts deep and wide to the east. To the south side there is a long semi-flat structure that corresponds to the remains of an old terrace which is known as Playa Hermosa. In the national park Irazu volcano you will find a variety of flora and fauna characteristic of the area, but the diversity of animals is relatively low, due to its altitude, deforestation and volcanic activity. There is also an area called the Fumarolas where water vapor and gases are emitted. The temperature in the zone oscillates between -6 to 17 ° C; The climate is classified as very humid, cold with a short dry season (December to April) and a rainy season (May to November). Often the mornings are cleared and the cloudiness increases during the course of the day. 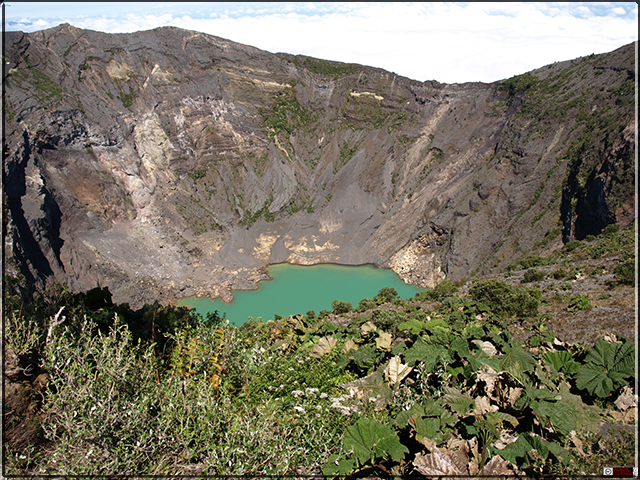 At the summit to the west of the main crater of the Irazu volcano you can observe on clear days the Pacific and the Atlantic Ocean, in addition to a large part of the national territory, and with telescope, you could enjoy the Nicaragua lake. The volcanoes name is due to an indigenous town that existed in the skirts of the volcano called Iztarú, word that for them meant hill of the trembling and thunder. However, over the years by verbal communication the name was changed to Irazu. This important volcano has a long history of eruptions and eruptive cycles. In addition to being an area of great hydrological importance, several rivers are born here that feed the river basins of the Chirripo River, Reventazon River, Sarapiqui River and Grande de Tarcoles river. On the way to the volcano it is common to observe areas dedicated to agriculture and livestock, such as the Tierra Blanca area of Cartago, in addition you can visit tourist sites like Durán Sanatorium, the Prusia park, and others important tourist attractions in the area. In the Irazu volcano national park you will find a variety of services such as asphalt road, parking lot, observatories, trails, cafeteria, bathrooms, information office, lunch and picnic area. This national park is open from Monday to Sunday from 8:00 to 15:30, this schedule includes holidays; and please remember to wear appropriate clothing, as it is quite windy and cold above; the best months to go are March and April as there is very little rain and visitors can observe from the Irazu the Atlantic and the Pacific Ocean, as long as the day is clear. It is one of the most visited areas in Costa Rica, both by national and international tourism, and if you are a nature lover we recommend you to take a tour of this national park.